The best players know that golf is a game of confidence, and most important, concentration-the ability to focus and block out distraction. The goal of achieving clear thought is also at the heart of Buddhist teachings. 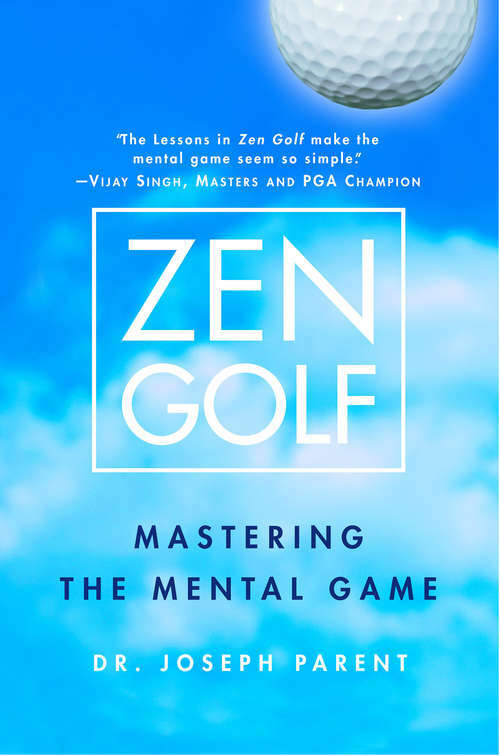 In his highly original and groundbreaking book, noted PGA coach and Buddhist instructor, Dr. Joseph Parent, draws on this natural connection and teaches golfers how to clear their minds, achieve ultimate focus, and play in the moment for each shot.Zen Golf presents a simple system for building "mental game mastery." Dr Parent's unique PAR Approach (focusing on Preparation, Action, and Response to Results) guides golfers with specific techniques for each aspect of their games. In chapters such as "How to Get From the Practice Tee to the First Tee", "You Produce What You Fear", and "How to Enjoy a Bad Round of Golf", the author shares a personal teaching regimen that has helped improve the games of professionals and amateurs alike. By combining classic insights and stories from Zen tradition, Zen Golf helps eliminate the mental distractions that routinely cause poor shots and loss of concentration, allowing golfers to feel in "the zone" that professionals have learned to master.Clear, concise, and enlightening, Zen Golf shows golfers how to prepare for, execute, and equally important, respond the results of any golf shot. A different approach to golf instruction, this book shapes ancient philosophies into new teachings.From the Hardcover edition.